Shot in 1987 and released the following year, The Testimony of Randolph Carter is an adaptation of the short story “The Statement of Randolph Carter” (with some elements from “Through the Gates of the Silver Key” thrown in for good measure). Said story was based on a dream Lovecraft had, with his friend Samuel Loveman having the Harley Warren role while he had the Randolph Carter part. Some have speculated that the unnamed book in the story is the fabled Necronomicon, although Lovecraft didn’t create said tome until years later. But, given the overall plasticity of the Cthulhu Mythos, that interpretation is not entirely impossible. Interestingly enough, the prop book from the film was utilized as the Necronomicon in one of the HPLHS gaming sessions a few years later. Let’s get something straight: this is NOT a film like The H.P. Lovecraft Historical Society’s adaptations of The Call of Cthulhu or The Whisperer in Darkness. This student film was their first effort at applying their years of LARP prop-making skills to a film. As a first effort, it’s naturally a little rough around the edges. Although the props are all incredible, the film’s low budget does show at times. Despite having access to a real stenotype machine, the lack of a location that looked like an actual courtroom resulted in the decision to keep the room as dark as possible. While not very realistic, it did have an interesting artistic effect. The film’s makers have noted how it also means this can be interpreted as the trial taking place in Carter’s mind. Being shot on videotape, the end result looks like some 80’s British import you’d see on PBS. But you know what? I don’t have a problem with that. In fact, I took more issue with how it uses the August Derleth version of the Elder Sign rather than Lovecraft’s original version. After a limited release and several appearances at the H.P. 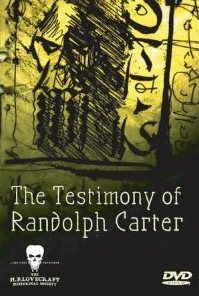 Lovecraft Film Festival, The Testimony of Randolph Carter is finally available on home video. However, it’s in the form of a DVD-R with no extras, (not even a starting menu). I imagine this was done to keep people from confusing it with their more recent films. Said films are made to evoke the feeling of the period when Lovecraft was actually alive, while The Testimony of Randolph Carter has an 80’s feel despite its period setting. It’s only 50 minutes, but does feel longer due to the numerous reading scenes. While reading the official HPLHS page for the film, I couldn’t help but notice the reference to plans for a reedited, shorter version. I discussed the matter with director Andrew Leman via email and learned the cut of the film on DVD is only slightly shorter than original version. The Testimony of Randolph Carter has an important place in history as it’s one of the oldest Lovecraft fan films (although not actually the oldest, as that honor goes to the 1975 adaptation of The Whisperer in Darkness). It’s also the longest of the first five and the only one that’s commercially available at the moment. AS it’s a well-made (but rough) first step, I definitely recommend seeking it out. Here’s hoping the H.P. Lovecraft Historical Society eventually decides to give it a factory-pressed DVD release with extra features. Given their distribution of a German H.P. Lovecraft adaptation, maybe they could even include other early Lovecraft fan films as well.